The Horse Forum > Training Horses > Horse Training > Don't Don't . . verses . . . Do Do! Don't Don't . . verses . . . Do Do! I posted this video by Warwich Schiller for a member on another thread. When I watched this video the other day, and I can't remember why I watched this particular one, because while it's focussed on some feeding issues initially, I am not having any feeding issues, I was more impressed with a remark he made rather lightly toward the end of the video. He explains to the woman about the difference between telling a horse "Don't , Don't (do that )" verses telling them "Hey! DO this!" telling the horse that is crowding you at feeding time, "Hey, Do that! (that meaning GO over there! way over there! And it got me to thinking about this on the whole scale. Think of the difference between , for example, asking your horse to 'walk', verses saying "don't trot anymore". Or, Do Stand here verses Don't walk off. When we think in terms of "Do" this, verses "Don't do that", I think we are much clearer in our expectation of what completes the task, what earns a reward, and thus the hrose can read out intention and respond much clearer. I think this is a good thing for us to ingrain in our thinking when we are trying to work with horses. loosie, gottatrot, akihba and 5 others like this. I wish I could 'love' this post Tiny! Great way of putting it! As Warwick Schiller seems to be good at putting whatever he says. Absolutely think it's so important to focus more on 'do do' and reward that, rather than focussing always - as so many seem to, on 'don't don't'. By all means, we should be ready to 'correct' where necessary, but the *focus* should be on teaching & reinforcing 'good' behaviours. And then there won't be so many incorrect answers to correct anyway! gottatrot, ClearDonkey, JoBlueQuarter and 2 others like this. In his book "The Faraway Horses", Buck Brannaman writes about offering alternatives rather than just saying, "Don't do this." loosie, gottatrot, ClearDonkey and 1 others like this. It's just the same for people. In Non-violent Communication theory they call it "the doable request". So named because it is a proposition not a demand (even if one complies with a demand it leaves a residue of tension). "Doable" means it has time and activity components and no subtext. Like the difference between "How come I do all the work around here?" and "Would you empty the wastebaskets before dinner?" With animals, offering an option is always better than shutting off an option and making them guess how to respond to that. When you close one side you open the other, unless you want your horse to go straight up! loosie, gottatrot, SueC and 2 others like this. Watching his example, I don't see ""Do do" vs "Don't do" so much as I see "When I say don't, I mean don't!" Before, she was saying, "I don't enjoy being crowded when feeding". After, it was, "If you crowd me, there will be negative consequences." And part of what he had her focus on was the attitude. In the first case, the mare stood back, but was still showing irritation at the feeder. The irritation indicated there was still a problem. The mare was still challenging. The problem wasn't the distance but the attitude. I feed my 3 horses 3 times a day. If they started shaking their heads at me, feeding would stop and horse chasing would start. When I am in the corral, the horses will be polite. To me and to each other. If one horse starts to bully another AFTER I set food inside the corral, feeding stops while I make it clear I run a tight corral. I learned that from Mia. I don't care if the horse is 60 feet away, if it is acting hostile while I am present, feeding stops. Because that rule is always enforced, the horses don't get aggressive when I feed them. Sometimes they go stand by their buckets and wait for me. Sometimes one will approach - the next one to be fed in line of seniority - and will tag along beside me as we go to the bucket. That is fine. It isn't the distance. It is the attitude. I also think nothing of dumping food in the bowl and then walking away as they approach. That is, IF they approach to get to the food, and not in a challenging way. If I need to go back and move a bucket of food while they eat, I do. The horse may move along, grabbing a nibble politely as I drag the bucket. If a horse became irritated with me, feeding would stop and hell would start. I just fed them breakfast. Hay pellets. Their favorite. They ran around while I got the buckets ready. Once I entered the corral, Bandit joined me and walked beside my shoulder to the bucket. Trooper doesn't like me. He backed off 30 feet and stayed away until I left his bucket. Cowboy - the smallest - stayed well away from the other two. As I walked toward his bucket, he walked toward it. We met there & I poured his food in. Then scratched his neck, told him I knew he was the most important horse, and I left. What they do do is up to them, and each acts based on his relation with me and the other horses. Now that I'm gone, they will play musical buckets. That is OK too. I prefer the electric fence analogy. The fence doesn't boss the horses. It just shocks them if they do the wrong thing. Other than that, it is passive. And therefor a horse can stand and eat with its nose a foot from the fence. Without tension, because it knows the fence isn't going to attack. Unless the horse touches the fence. 100% consistency. I want thinking horses, not ones I direct. When possible, I expect them to decide. Bandit had a tough time with that when he first arrived. It took him 6 months to figure out I wanted him to make decisions and/or discuss them with me. He is now the Odysseus of the corral. loosie, gottatrot, SueC and 1 others like this. Last edited by bsms; 04-07-2019 at 10:03 AM. "Doable" means it has time and activity components and no subtext. They even have "ask, tell, make"! I never really thought much of it until reading this. I DO and not DON'T. (You - understood) Stand, Point and say There, Walk (or whatever gait I want until they comply). 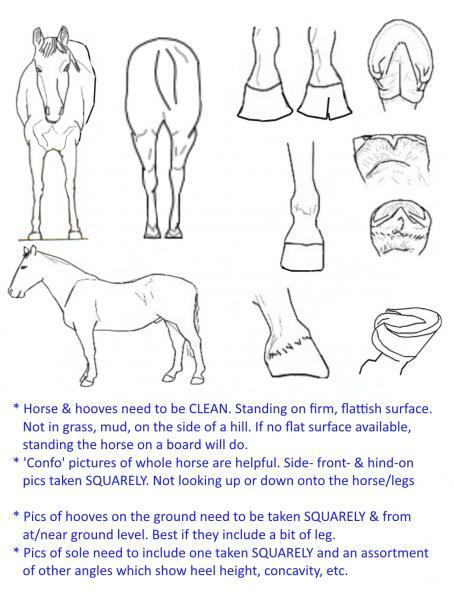 It got me to thinking about the different horse owners I have known and how they worded their commands. There are quite a few that I know that were in the DON'T category or the Get Off Me category. They are usually the ones that are always asking for advice or sending/arranging for training. Or selling and buying something else that they then have the same issues with. It's a large yet subtle difference. You shouldn't go around yelling DON'T! DON'T! DON'T! without giving the horse a "do" - an acceptable replacement behavior. This also kind of goes along with the saying "direction is better than correction." loosie, SueC and Alder like this. Thank you for posting this! Very easy to see and understand the difference between DON'T and DO. It just seemed a good mental approach. For example, when riding , and you're trying to get a leg yield., and the horse is not moving over because they are leaning on your inside leg, which is pushing against them. If one started the whole procedure with the mental image of 'please move sideways over there', I really think there would be less of a 'hot spot' of your leg, and his side becoming resistant to each other. And when resistance gets started, both sides tend to zero in on that spot, in the "don't push on me" mindset, and forget the direction of the original intent. I know this sounds woo-woo.